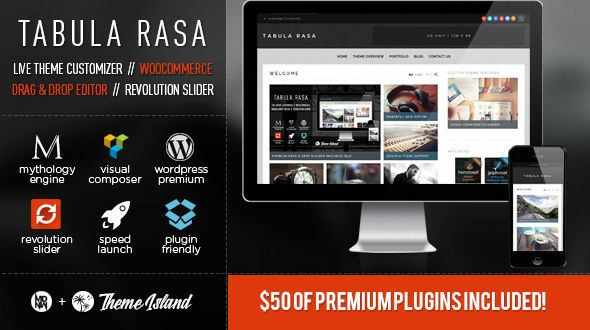 Tabula Rasa is an responsive, multipurpose, WordPress Theme. It’s beautiful, clean and professional. We built this theme to be used for any project and include easy to use live customizers and drag & drop builders. We built this one for businesses, studios, and agencies – but we include awesome features that can benefit any website. It’s capable of almost anything, but we pride ourselves on how well this theme works out of the box. Check out our feature list below! Always loaded with the freshest, most stable version of Visual Composer! Mythology Engine has been developed with the sole purpose of creating an efficient method of publishing themes with a streamlined development process… Key features include white-label options panels, “in-dashboard” documentation, and a no-nonsense approach to content management & theme options. User interaction has many benefits. One is that it can create focus and increase customer retention. Use Visual Composer to add these custom hover modules to your content. Don’t forget to add links and calls to action with these Custom Hover Modules to increase internal traffic and interactions. Choose a custom image, background color, add custom content, and select a start height and end height for the modules on that page. The most popular & easy to use “mega slider” plugin to ever exist!!! OK, that’s hyperbole, but it’s honestly pretty great and I’m thrilled to announce that we are now including Revolution Slider 4. This latest version includes: brand new admin interface, more options, more conveniences, custom caption animation builder, full slider import/export, and much more! You can also include Revolution Slider as your ad space slider, pre-content slider, sidebar slider and within individual posts/pages. Sweet! Customize your theme’s typography easily with instant Live-Previews as you select your options and see how your site looks with any font, color, or size before you hit “Publish”. Integrated with color pickers and the Google Fonts library, so you’ll have 1,000s of fonts to choose from. If Google Fonts aren’t enough, we integrate seamlessly with Typekit, Fonts.com, and other popular services. Our goal is to deliver a theme that anyone can use & customize, without any need for 24/7 customer support or long-winded documentation manuals. We recommend uploading the theme demo if you want a head start, but the theme has truly been designed to be answer any of your questions as you use it, so don’t fret if you don’t know how to code. If you need some more information on something included with the theme, we’ve put together a dedicated information site for this theme. If you still need some help or have a question, feel free to ask us at our dedicated support forum. Just make sure to include your endgoal to help us understand how we can help. In addition to the Theme Options panel (which manages the global theme options), this theme also integrates Page & Post options that allow you to override any global rules for that one page or post. These panels will show up on any Page or Post editor, underneath the basic content editor. In the event that they do not appear, make sure that you have enabled them from the top-right “Screen Options” panel. These panels will allow you to override theme-level options on individual pages and posts. To take this even further, we added custom options that show up depending on the page template used. 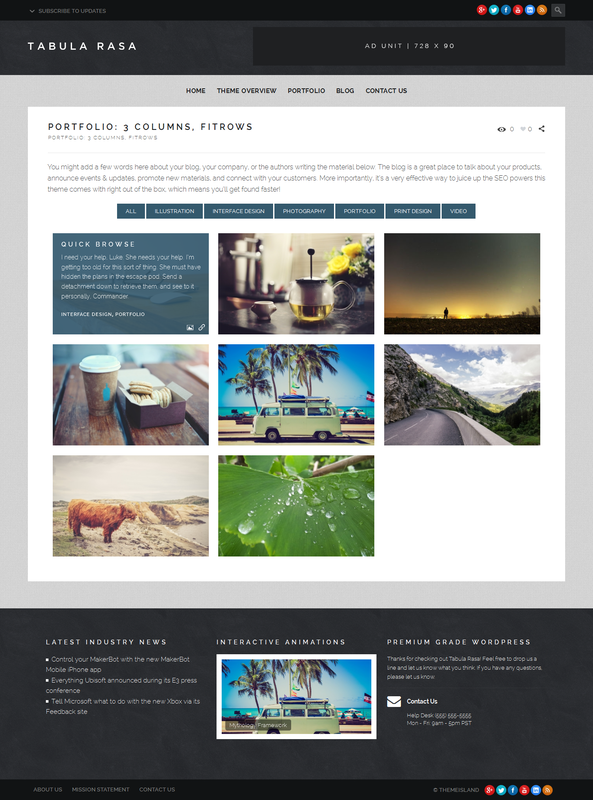 This includes page template specific options for the Blog Page & Post Grid (Portfolio)templates. These panels will show up on any page with the Blog Page template or Post Grid template selected. Eliminate the guesswork from customizing the theme. Built on the WP Theme Customizer API with some special tricks blended in, you can change just about every typographic or color across the entire theme… there’s no need to reload the page on the front-end though – the Theme Customizer will show you an instant preview of what your changes look like right there on the same screen. The full library of Google Fonts is included in the Theme Customizer (and yes, live-preview works on the font-faces too). Just open up the customize panel and start playing! - Additional header layout options. - Additional page layout options.